At Croteaux, we make Rosé, and only Rosé. We are the only vineyard in the United States to do so. Made from estate grown Merlot, Cabernet Franc, and Sauvignon Blanc our wines combine the traditional tastes of southern France with the distinct seaside style and agrarian history of the North Fork. Our efforts, from vine to bottle, are focused on making dry, crisp, fun-to-drink wines, every sip filled with the distinct natural flavors of each varietal. We call it "Rosé On Purpose”, and it is safe to say that pink is our favorite color. We harvest the grapes in September and the wines are bottled in February, allowing us to produce new vintages in time for each upcoming season. In a short period of time, we aim to produce the richest variety of rosés possible. Our large volume rosés are produced in partnership with Premium Wine Group, just 7 miles west of our farm winery, while a select few varieties of boutique rosés are oaked and aged on site. In keeping with the centuries old tradition, our rosés should be consumed while young and fresh, within a year or so of their production. We insist on keeping sulphur and levels to a bare minimum in our on-going pursuit of simple, honest wines true to the region they are made in. In our eyes, good Rosé should be clean, crisp, and, above all, drinkable. It is the one wine where “local and recent” trumps “heritage and vintage”, and no other wine disappears quite as quickly by the beach, or at any and all shapes and sizes of soirée. Trust us, we speak from experience. Once you go pink, it’s all you’ll want to drink. Terroir refers to the discussion among wine insiders about the various qualities that define a specific wine region. Soil composition, climate data, topography, weather, growing days and other agricultural details all influence the characterization of wines made in specific locations throughout the world. However, the lifestyle of a region remains rarely discussed. At Croteaux, the easy-going, summer rhythm of the North Fork inspired our wines from the start. Now, nearly a decade later, we believe that our wines, in turn, inspire and compliment the local sense of joie de vivre by the sea side. The East End of Long Island is surrounded by water – the Atlantic Ocean, Peconic Bay, and Long Island Sound—making us a wine region posed between farmland and the beach. Each summer brings new life to the North Fork. Visitors and locals alike enjoy the rejuvenation of a vital, local culture surrounding this most seminal of our seasons. 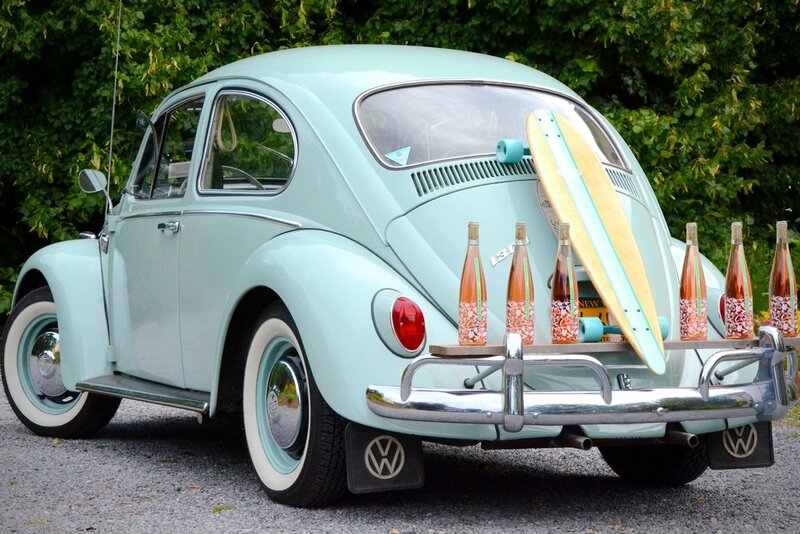 Summer on the North Fork is all about the surf, the sand, and what’s for dinner. While often topographically compared to Bordeaux as a region, The East End of Long Island culturally resembles the beachside leisure of Provence. All things considered, we wanted to make wine that not only grew well in our soil and climate, but also wine that paired well with all of our dizziest summer daydreams. Our answer? Rosé. Each year, we anxiously await the release of our wines, as they signal the summer months to come and all the memories they have yet to hold. THE MISSION: We are dedicated to making dry, Provence-style Rosé crafted from our unique North Fork varietals. THE RESULT: Extremely drinkable rosés that strike a subtle balance of fruit flavor and crisp acidity. Our on-going crusade to keep additives at a precipitous low throughout the wine making process allow the natural character of our wines to shine through in our finished product. THE HOW: We grow and harvest our grapes with Rosé in mind. We harvest early each year, between September and October, to ensure that our fruit goes into the tanks just on the cusp of its peak ripeness. Early harvest not only ensures optimal weather conditions, but also ensures balanced levels of sugar and acids, as well as skins just thick enough to lend a subtle hue to the wines in their tanks. All of our grapes are hand picked then de-stemmed and pressed. The juice is immediately separated from the skins, giving the wines a pale pink or salmon color. Stainless steel fermentation rounds out the style of each wine using wild yeast in some varieties. Our sparkling wines are infused with bubbles using the Charmat method. Sound fancy? Think of it as rosé soda, because it’s that easy to drink and every bit as delicious. Come the end of February, a new batch of Croteaux rosés are ready to hit the shelves. THE WHY: American rosés have a reputation as afterthought wines, the by-products of red wine-making process, in which winemakers bleed off the first-press juice, unsuited for full-bodied red wines, and recycle it into a batch of Rosé, high in sugar, additives, and overwhelmingly acidic. We wanted to re-write this reputation, by giving our rosés all the tender love and care they deserve in the tanks, so that you can enjoy them fresh out of the bottle, as rosés should be enjoyed: light, crisp, and too good to have only one glass. Croteaux Vineyards was planted in 2003, after years of careful planning, soil preparation, and determined land preservation actions. We planted specifically selected “clones” of Merlot, Cabernet Franc, and Sauvignon Blanc, all vinifera grapes selected for each soil type on the farm. “Vinifera” meaning our vines hail from a lineage of common European grapes (Vitis vinifera) that are the chief source of Old World wine and table grape varietals. Our Vineyards total ten-and-a-half acres on our fourteen-acre site, totaling 1089 vines per acre. The highest point of the vineyard is 28 feet above sea level and the lowest point, 9 feet. The southeast edge of the vineyard is just 100 feet from a tidal salt-water inlet. Trellising allows us to support the vertical shoots that grow from the vines in the Spring. 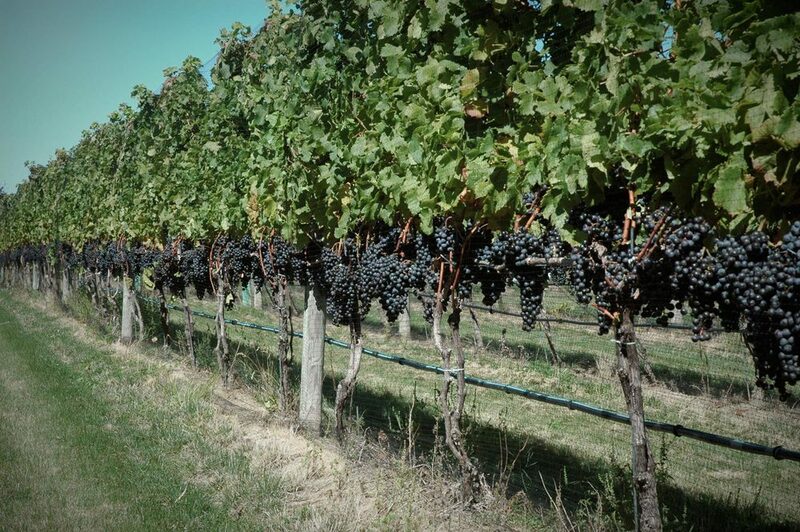 We cane prune each vine in the winter allowing our grapes to grow from new wood each season. During the growing season, extensive leaf leaf pulling, hedging, and canopy management, all done by hand, assure airflow and sun exposure on each grape cluster. Our grapes are hand picked during harvest season so that only the highest quality grapes are sent to the winery. They say, "great wines are made in the vineyard", and each season our vineyard is managed and maintained to provide us with the highest quality fruit possible. Croteaux Vineyards occupies the land of two historic North Fork Farms, each with a long agricultural history, The Howell Farm purchased in 1992, and the Stepnoski Farm purchased in 1994. Both farms operated for generations in the same family over the course of centuries. The Howell Farm, where our Tasting Barn is located dates back to the 1700’s, and contains an 1889 farmhouse, the tasting barn and garden, and three additional historic barn structures. The oldest structure on the property is a three-bay, post and beam, Dutch Colonial barn of hand hewn oak timbers dating back to 1749. The old Stepnoski Farm between South Harbor and Bayview Roads also contain an 1850’s farmhouse and barn on 17.5 acres that have been moved to the North West corner of the property, and are now under different ownership. Our original goal in purchasing the farms was not planting a vineyard or making wine, but rather to restore the historical structures, effectively preserving monuments to a way of life that was and still is quickly being lost. Southold Town, the oldest town in New York settled in 1640, originally constituted an array of small villages, a distinctly rural atmosphere, and beautiful, pristine shorelines. Locals have fought to keep Southold’s historical, New England charm ever since development began threatening the sprawling landscape in the early 20th century. The pressure of development and subdivision for housing, a dwindling market for farmland, aging family members, and a lack of financial viability for farming in the region have caused countless farmers to go bankrupt, threatening the regions roots, both historically and literally. Both of our farms are now part of a land preservation program and cannot be sub-divided or developed. 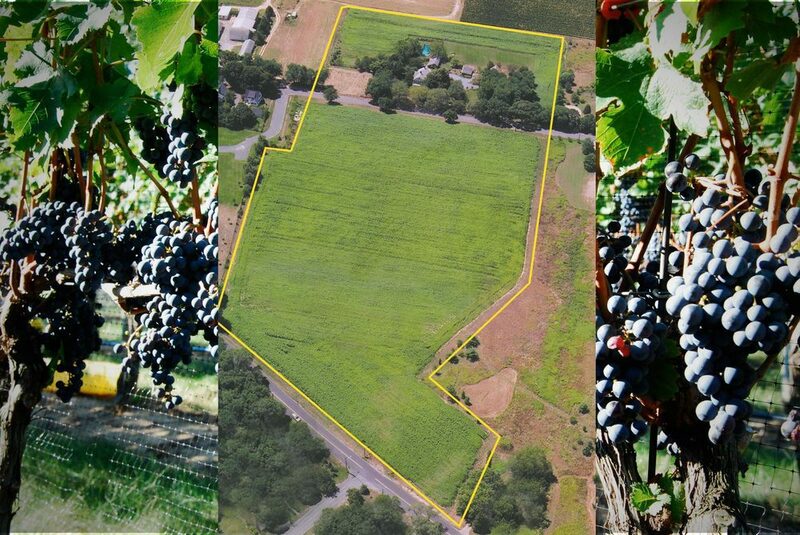 Growing our grapes has resurrected and preserved these two farms for future generations. We hope to continue supporting the preservation of our agricultural history on the North Fork with the help of farmers, vineyard owners, and the local community.